I needed to start using the leftovers from, oh, about a month ago, so I used up the leftover graham cracker crumbs for the crust in this pie. 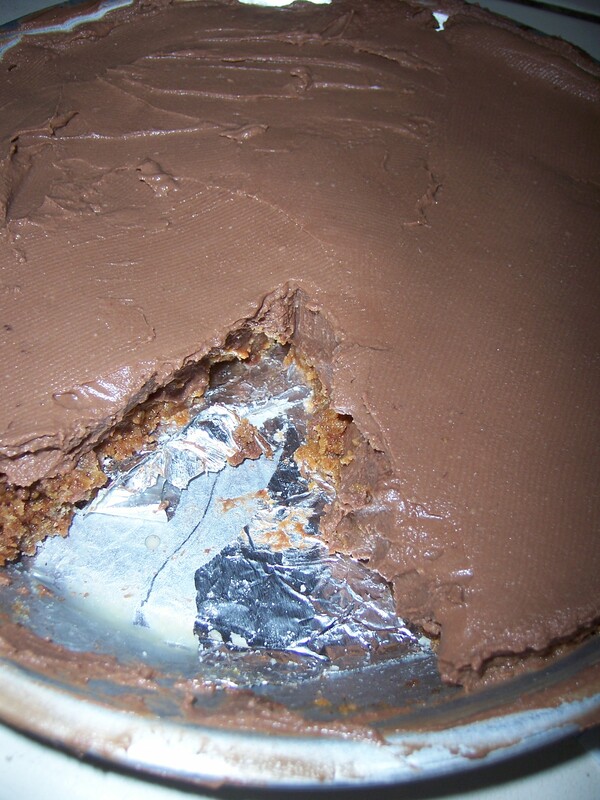 It was a really rich chocolate-y pie, and I think I would’ve liked just eating the filling by itself, because it was basically just homemade pudding, some might even say it is ganache-like. I have to start finding recipes that use up the other ingredients I have left, but luckily, those don’t really go bad. Also, I have a few cookbooks and recipes saved that I am sure I will find one that works for me. This recipe is saved from Gourmet and is called Chocolate Cinnamon Cream Pie, but really, the only cinnamon in it is from the crust and the whipped cream that you may or may not dollop on top. So, really, it is just a chocolate pie, with a graham cracker crust. But nonetheless, it was simple and good. I have worked with gluten-free flours before, and with all of the rain, I just didn’t feel like trekking all the way down to the Mission to get what I needed, so I used wheat flour. It was a simple change to the challenge recipe, just replace the gluten-free flours with wheat flour. The graham cracker dough was sticky, and I ended up adding a little extra flour while I kneaded and rolled it out. Since I don’t really like plain graham crackers (or s’mores) and I knew I would have extras, I didn’t really pay that much attention to the shapes of the crackers themselves, and just baked them for the crumbs. Oh, of course I tried one or three before smashing them to bits, and they are good on their own. But I will surely make a tart or pie crust of some sort with the leftover crumbs. 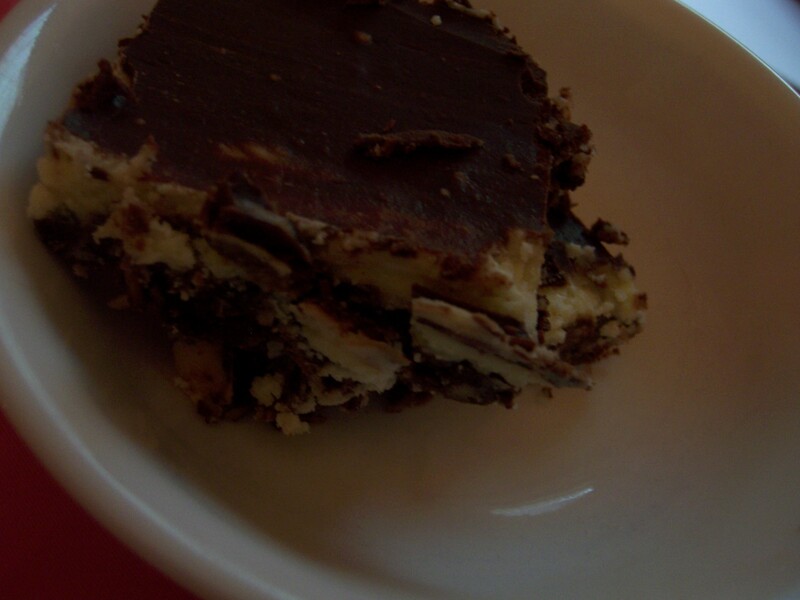 The Nanaimo Bars were pretty easy to make, and all of the layers make a tasty treat. I only have half of them left and I only made them on Monday. I do have a lot of leftover ingredients that will have to be used some how, so look for recipes featuring these ingredients again (such as the graham cracker crumbs). I hope this post gets the Daring Baker’s stamp of approval. Take the jump for the recipes. they’re not the prettiest that I’ve seen, but they were tasty. So, I made some chicken soup the other day because I was feeling a little sick, but I forgot to buy crackers to go with it, so I made my own. I used this recipe I found on this website but I took away the egg wash and the sesame seeds. I am sure they are less bland with these components added back in, and if I make them again, I might sub in olive oil for the veggie oil. 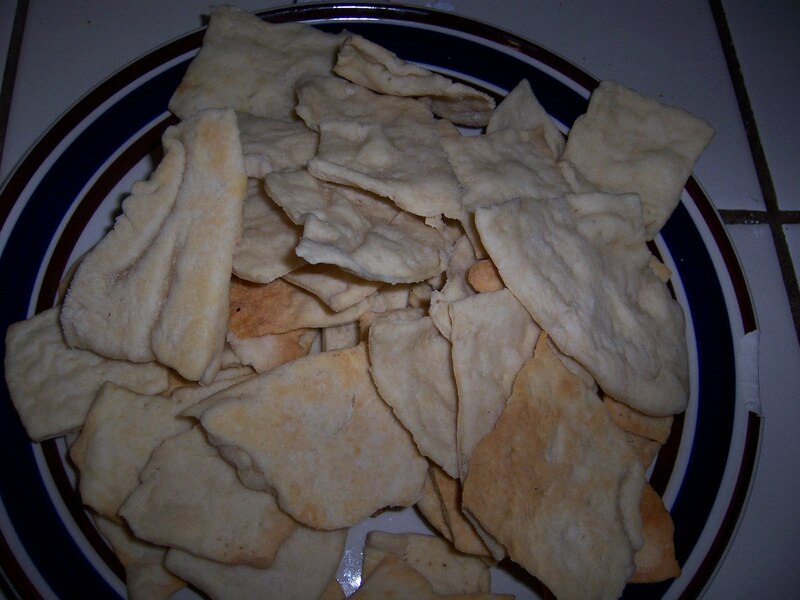 The site happens to have a variety of other cracker recipes too. Make sure to roll the dough out thin to get the right texture. I would use a pasta machine, if I had one. It would be easier, and I would know that it was all the same thickness. But of course, doing this by hand is fun, too. Lightly grease two 14×17-inch baking sheets. Combine flour, baking powder and salt in large bowl. Stir in water and oil, mixing until smooth dough forms. Halve dough. Flatten 1 piece into large square directly on 1 prepared sheet. Cut into 2 3/4 x 3 1/4-inch pieces, leaving in place on baking sheet. Pierce all over with fork. Brush generously with egg white mixture. Sprinkle with half of sesame seeds. 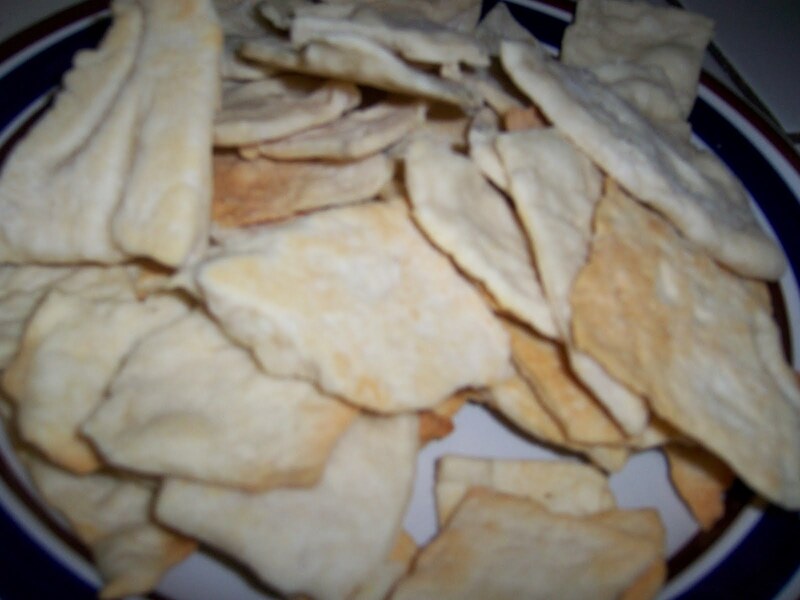 Bake until crackers are dry and golden, 10 to 12 minutes. Cool on racks. Store crackers in airtight container.